Mapping workshop introduction and Google My Maps Tutorial by Lele Kimball at the Oahu workshop. Mapping at Kamehameha Schools with partners on Maui. On June 26 and 27, our team took a tour to Oahu and Maui to hold workshops with various partners and map current and desired vegetation management activities. Activities could include any vegetation reduction or conversion projects such as roadside mowing, fuelbreaks, grazing rotations, clearing around structures or power poles, brush abatement or thinning, tree trimming, loi restoration, agriculture, and native forest restoration. 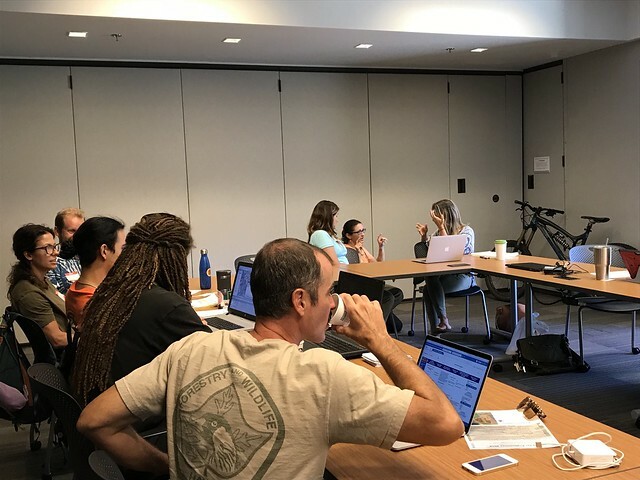 The Oahu workshop took place at the University of Hawaii at Manoa campus in a high-tech room fit for a mapping workshop. Koolau Mountains Watershed Partnership and other Koolau Mountains stewards joined us for the workshop. The following day, we held two workshops, one in the morning and one in the afternoon, with land managers on Maui. We had help from our friends from Leeward Haleakala Watershed Partnership, West Maui Mountains Watershed Partnership, Maui Conservation Alliance, and Maui Cattlemen’s Association for getting the word out about the workshops. Big mahalo to them!